The Puglia Technological District Dhitech organizes a “workday” on the topic of social innovation for smart communities, given the following events: the closure of the training project “Activating Puglia @ Service”, the subsequent launch of innovative startups and beMINT and the launch of the Strategic Plan “DHITECH 2020” that will be based on its design for the coming years. Puglia@Service is a project accepted by the Ministry of Education for funding under the Programme R & C 2007/2013 which operates in the field ” Engineering Services Internet-based “and has produced interesting innovations in the conception, design and provision of services based on the Open Innovation paradigms. The Living Lab PugliaSmartLab has had a fundamental role, being a space for innovation in which citizens, government and businesses work together on an equal basis for the identification and solution of concrete needs of the territory. The desire to give continuity to the activities and projects within Puglia@Service, beMINT was founded. beMINT is a spin-off of DHITECH, founded by 16 young social technologists that work in the context of innovative knowledge and internationalization, aimed at introducing new paradigms of innovation and development in the local context. The theme, “Technology Social serving smart communities“, will be divided into a number of speeches and debates enhanced by the presence of Andrea Di Maio, vice president of the Public Sector in Gartner Inc., (the US leader in consulting and research specialist in the field of innovation) and Greg Delaune, CEO and founder of Global UIX, counseling agency for economic development based in Berkeley. 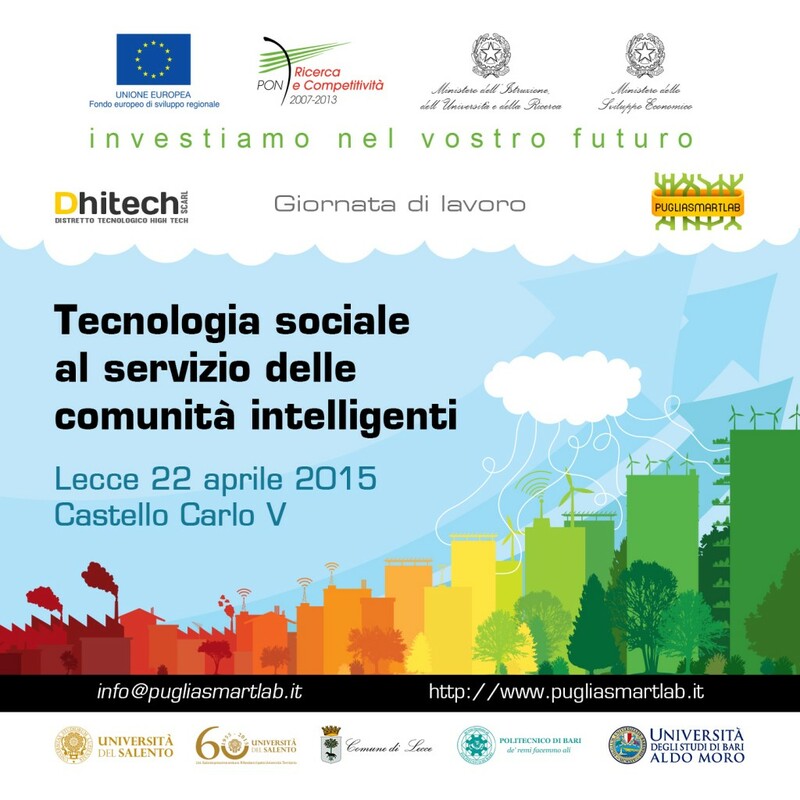 The event will be held in the heart of the city of Lecce on April 22nd, 2015, in the hall of Maria d’Enghien Castle of Charles V. This event will be the starting points for a reflection on the state of art in the field of ICT applications to services and development of a broad debate on the situation in Italy between different points of view in the academic, economic and business fields. Social technology is a tool that enables the creation of intelligent communities and management of participatory processes from the bottom able to respond to new emerging needs. This new paradigm requires a mutual interaction between the processes of technological innovation and social transformation and highlights how the Public Administrations and all the stakeholders of a territory can and must be guarantors of this virtuous relationship. This event will also be an opportunity to understand the state of the art in terms of technological and social innovation in our country, but also to strengthen the synergies between public and private, between citizens and technology professionals: the goal is to give space and voice to innovation in all sectors, to network, exchange ideas and solutions, to partnering and planning new opportunities, in line with the new strategic objectives and Italians and Europeans investment, referenced by the new strategic plan of DHITECH. 10:30 to 10:50 The development strategy of the Cluster Smart Communities, opportunities Italian and European – Laura Morgagni – Cluster “Smart Communities Tech. • Alessandro Delli Noci – Assessor of technological innovation and youth policies, the City of Lecce. • Mauro Moruzzi – Scientific Director CUP2000. • Giuseppe Marchionna – Vice Mayor, City of Brindisi. 13:00 to 2:00 p.m. Eat, drink & pitch! 14:00 to 16:00 “Debate and reflections on the future: #Innovazione and #Government” moderated by Giacomo Ferrari, journalist at the Corriere della Sera.